Windows Vista Inkball game is excluded in Microsoft Windows 7 and following Windows 8, Windows 10 operating systems by Microsoft. 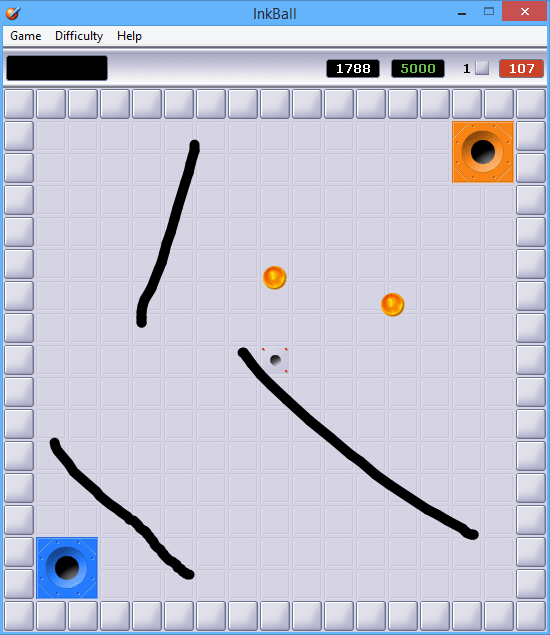 Inkball game was first included in Windows Vista. I know that many Windows Vista users love to play Inkball, and I know that they are dissapointed with a lack of Inball Win 7 version of this Windows game. 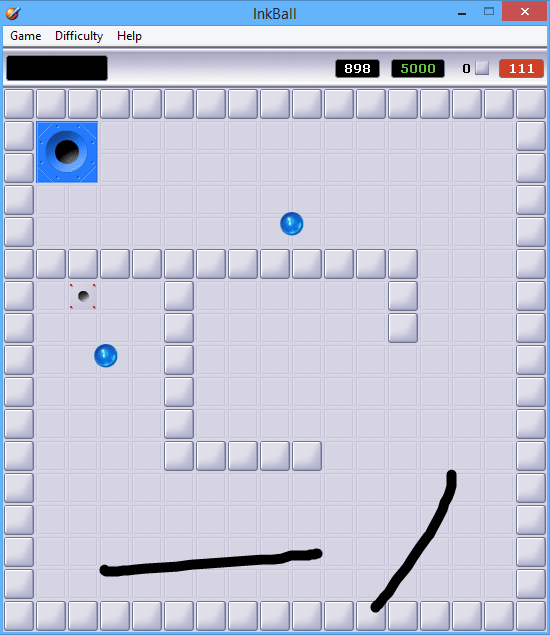 I remember that Inkball game players tried hard to get Inkball game working on Windows 7 computers. In this short Inkball game review, I want to talk about this Windows game Inkball rules for players as well as how they can download Inkball for Windows XP or download Inkball for Windows 7 or for Windows 8. It is a pity that those Windows games players hoped that Microsoft will again include the Inkball game within Microsoft Windows 7. Unfortunately their hope was ruined when Inkball Win 7 is not included with Windows 7 RTM version. Do you think Microsoft might add Inkball with the Windows 7 Service Pack 1 Beta version ? You know these days, Windows 7 SP1 Beta is released for public test, so we will download Windows 7 SP1 and install, later we can say if Inkball is included or not. I, myself and my child, we both looking forward to play Inkball for Windows 7. On the other hand, gamers have built a solution to play Inkball game on Windows 7. If you are also a fan of this Windows game, you can still play the game Inkball on your Windows 7 computer as well as Windows XP PC. Please refer to article Game Inkball Download for Windows 7, Windows 8 and for WinXP in order to download and install Inkball Win 7. If as a game player, you enter the ball into a hole with different color the game ends or when the game timer runs out the Inkball game ends again. So do your best to insert the blue balls into the blue hole and keep them away from orange colour holes. Similarly, insert the orange balls into the orange holes and keep them away from blue holes to make best scores in the Inkball game. What you will get is the message informing the failure "A ball entered a hole of the wrong color." if the ball and the hole colors do not match. And if the timer counts down till 0 and you have still balls rolling on the game board, the failure message will be "You ran out of time." 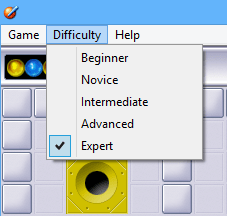 Windows gamers can adjust the game difficulty level using the Difficulty menu of the Inkball game. With increasing difficulty level of the Inkball game, Windows gamers will have game balls with higher speed. Inkball game players can start with Beginner level and increase the difficulty level step by steps for more challanging games as they improve their strategy and experience in the game. The number of balls rolling on the Ink game game board will simultaneously increase. There will be more holes on the Inkball screen to avoid from unmatched colored balls. And the complexity of the game board will increase. Players can draw ink strokes on the Inkball game board. These ink strokes will disappear when a ball hits the stroke. Just like the ball hits a wall or an other ball, the ball will reflect with same angle when the ball hits the ink strokes. Within the Inkball game, another color "gray" is neutral which means you can enter a gray ball into a hole with any color, or you can enter a ball with any color into a gray hole. Unfortunately in these cases Inkball game player will not gain any points. If you target more points, you can draw lines over the gray holes so that when a ball comes through the gray hole, it will reflect from the line. And the dissapearing line previously drawn over the hole prevents the ball drop into the hole and a point loss due to that.